The T300 Stage Series is richly appointed with solid Red Cedar tops, Indonesian rosewood back and sides, honey mahogany neck, and a refined French satin finish. The solid Indonesian rosewood headstock is oil-finished, and inlaid with the maple LAG logo. Fine Indonesian rosewood also provides an easily-played fingerboard and a solid bridge. The black graphite compensated saddle and nut nicely complement the satin black tuners - with matching satin black tulip buttons. 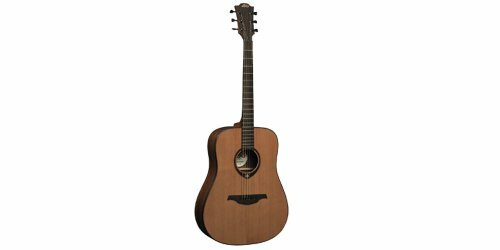 Studio Lag Plus electronics are used in both the Dreadnought and Auditorium electric models, providing an excellent warm and accurate amplified sound.